Interlocking puzzles have, for me, the same effect as rope puzzles: very interesting designs, beautifully made, challenging to disassemble and a nightmare to put together. With this in mind, it's no wonder that I don't have many interlocking puzzles in my collection, but seeing a puzzle like the one above and quite affordable, mind you, it's rather difficult to resist. Knotty 6 is designed by the prolific Yavuz Demirhan from Turkey, and manufactured by Pelikan in the Czech Republic. The puzzle is made from very high quality materials and a lot of care went into producing each copy. The wood is dried to 8% moisture, and a lot of varied species of wood are used to have an extensive diversity of colors and textures in their designs. 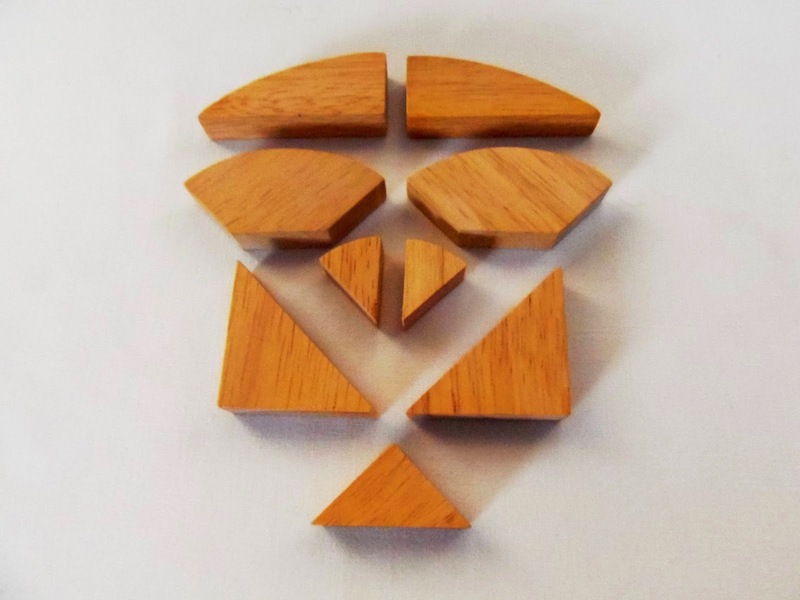 The puzzle consists of six identical P-shaped pieces, or congruent, and they interlock to form a tight knot, which at first seems impossible to undo. However, the two holes inside allow for the pieces to move in a certain way so it's possible to remove one piece at a time. 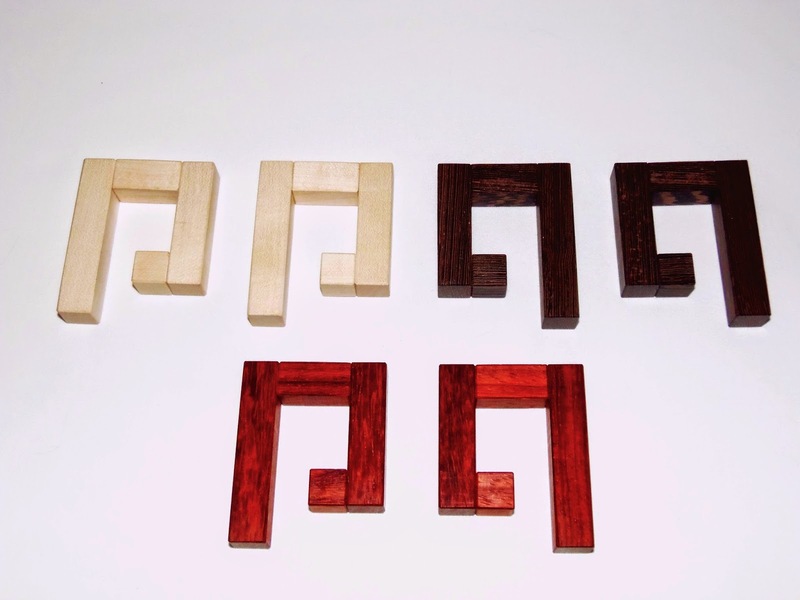 I found that there are multiple solutions to remove the first piece, as seen in the pictures below, which indicate that any of the three colored pieces can be the first, although the solution is identical in all three occasions. The pieces move by sliding them one unit at a time. You need two moves to remove the first piece and another two to remove the second. No rotations needed. Like mentioned above, taking the puzzle apart is not the most difficult part. I actually prefer to disassemble it...but, like most puzzles in this category, the real challenge comes when you try to put it together again. First you have to visualize how the shape of puzzle comes together. This is easily done by taking a picture before disassemble it. Then, you have to figure out how to combine the pieces so they interlock in the right way - Easier said than done. Having fiddle with the puzzle for over two hours I gave up and went to look its solution up. After seeing the solution I felt a bit stupid for not figuring it out for myself sooner, as it looked pretty simple. This is rated as a level 7/10, but I guess it depends a lot on how comfortable you feel about solving this type of puzzles. I reckon it's quite easy for an experienced puzzler, but very challenging for a beginner like me. 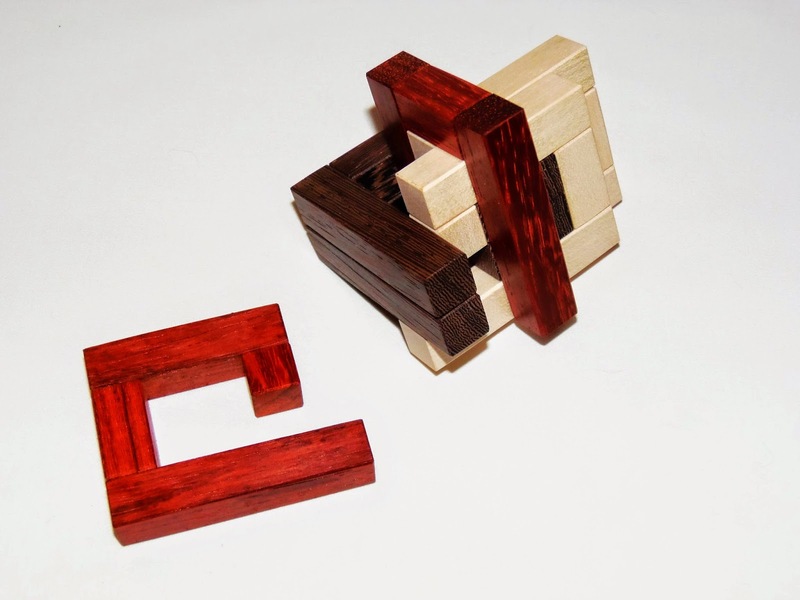 Puzzles like the Knotty 6 are some of the most beautiful interlocking puzzles out there. 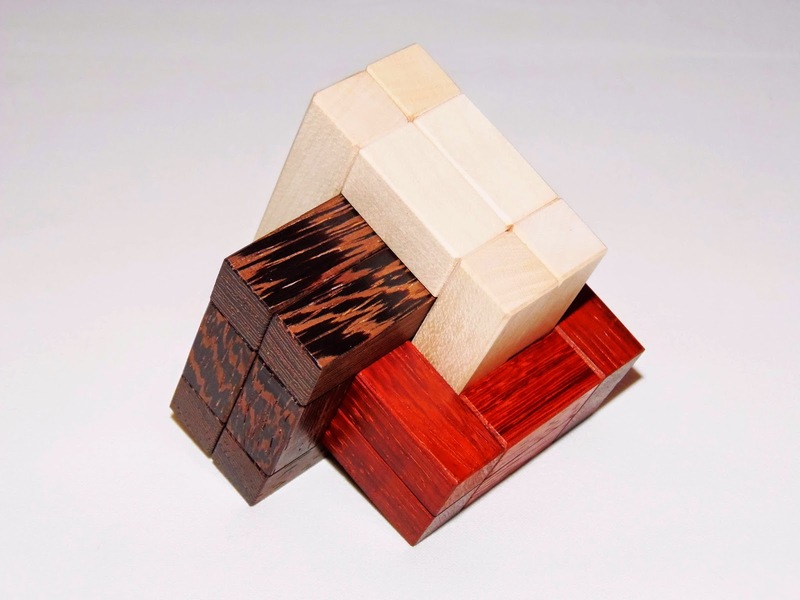 For a collector, even if you're intimidated by these puzzles, it's really worth having one... or more puzzles from Yavuz. 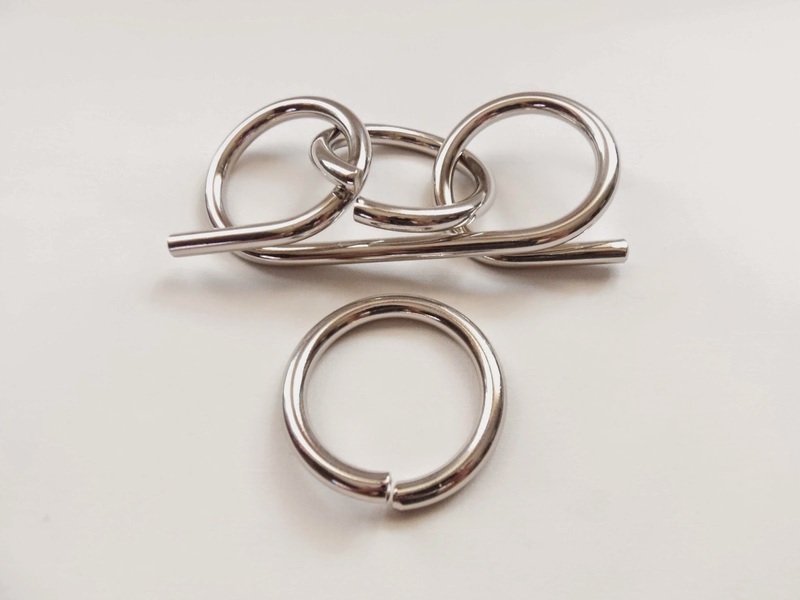 Availability: The Knotty 6 is available at PuzzleMaster for just $19 CAD. You can also check out other beautiful designs by Yavuz Demirhan or made by Pelikan. 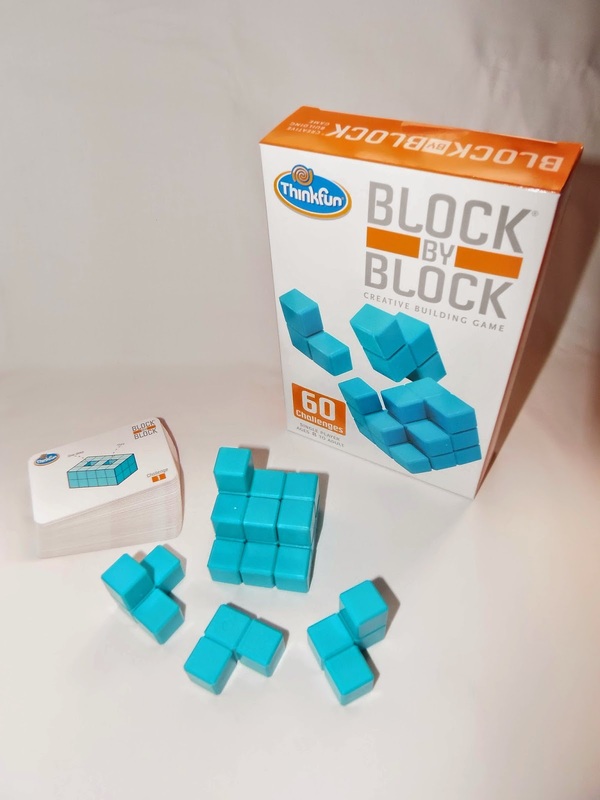 Block by Block is the last one of the "By" series by ThinkFun I'm reviewing. Previously reviewed are Brick by Brick, Shape by Shape and Square by Square. All puzzles are very interesting and some, more than others, are quite challenging but fun to play with. 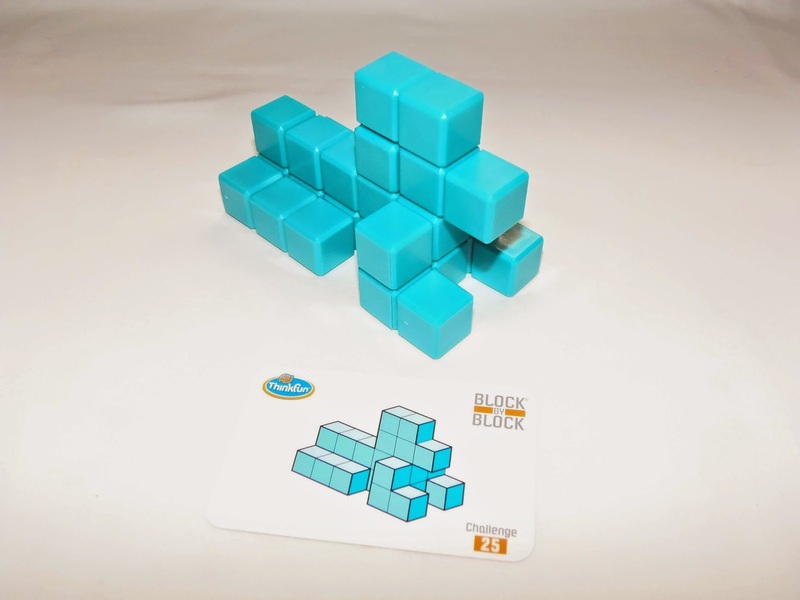 Block by Block is essentially the 7-piece Soma Cube, invented by Piet Hein, but with a new presentation. Sivhy Farhi was responsible for researching new shapes which are included in the form of 60 challenging puzzles. Presented in a light blue durable plastic, the game is also the most difficult in the series. The challenges in the other three games can be solvable in a flat surface as a 2D puzzle. However, because the challenges in Block by Block have to be built in 3D, it becomes much harder to visualize the intended shapes. 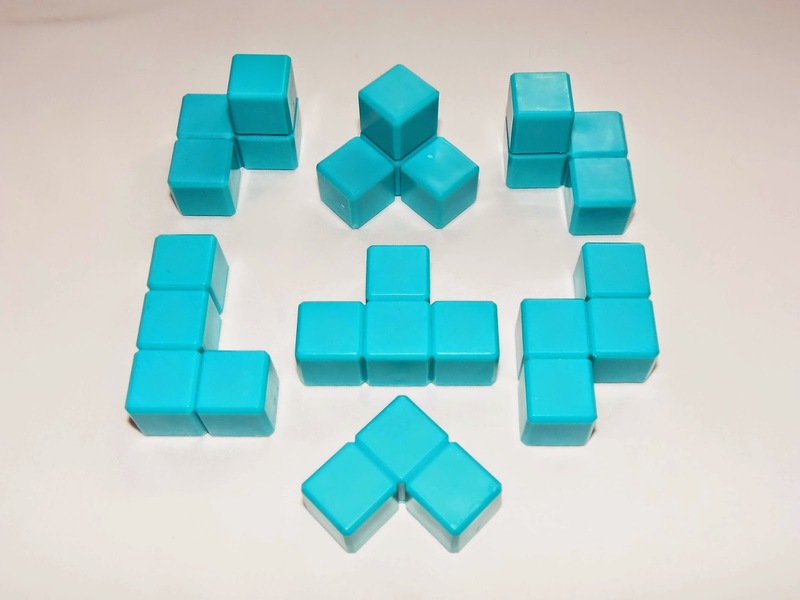 The most common shape to build is, of course, a 3x3x3 cube, but there are countless other shapes you can build. You have 60 different challenges to get more familiarized with the puzzle's concept, and after that you should have your skills improved to try and make your own shapes. All challenges must be solved with all seven pieces. The cards are not separated by difficulty, so you can choose the ones you like most and the difficulty should be about the same for all of them. If you get stuck with any of the challenges you can always flip the cards and check out the hints at the back that help you see how the pieces should be placed. Some of the challenges are a little difficult to see how the back side of the image should look like. One strategy is to try and build the shape as you see it in the image and the rest will eventually come to you. Each of the 60 challenges have multiple solutions, so there's many ways to achieve the same objective. Whether you prefer 2D or 3D puzzles, the "By" series have something for everybody. 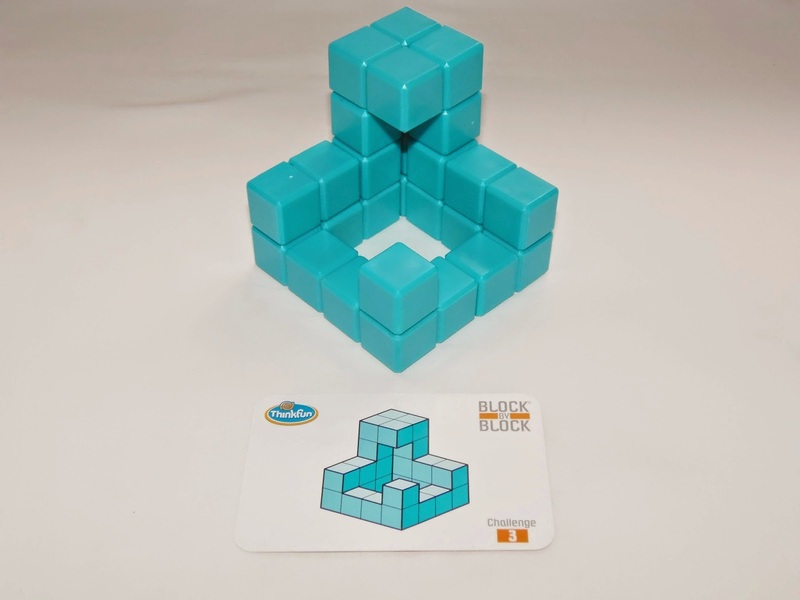 The Block by Block may be the hardest, but it's also the most versatile, giving you the ability to built millions of different shapes with the 7 pieces provided. 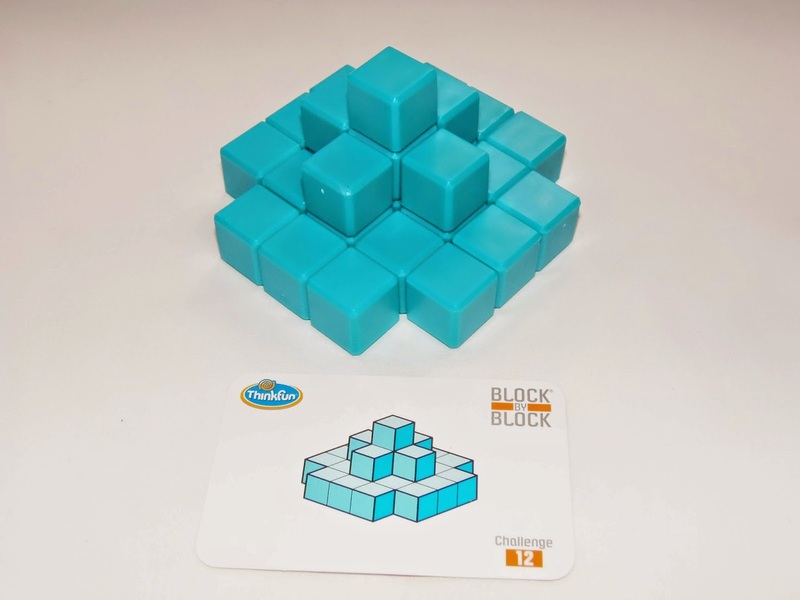 Availability: Block by Block can be purchased at PuzzlesdeIngenio.com. 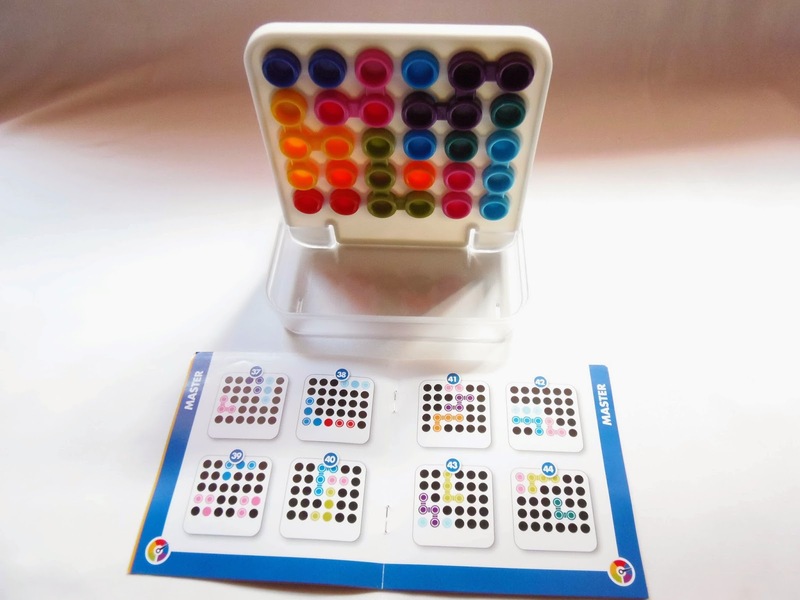 More ThinkFun games here. Ich Bin Ein Bärliner - a mouthful - is a very interesting packing puzzle by Marcel Gillen that plays very well with the concept of Picture Frame Puzzles (one of my favorite types of puzzles). 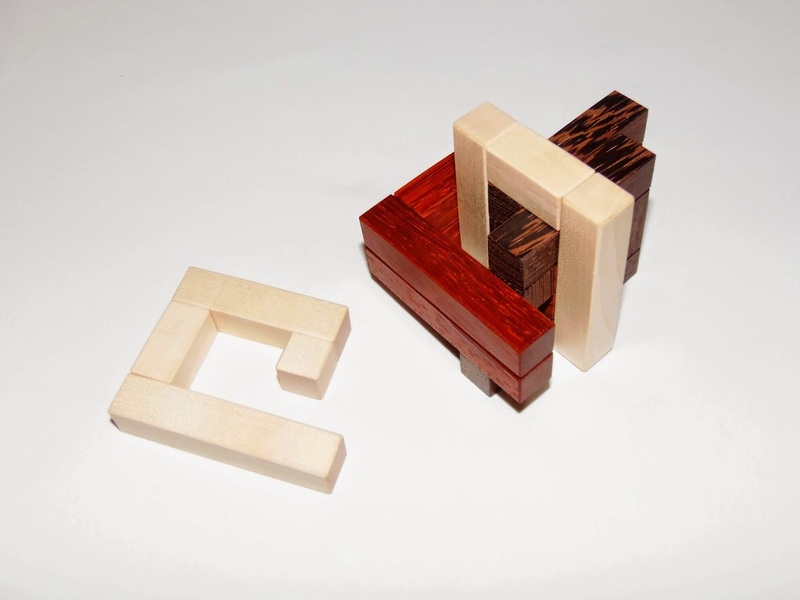 It is manufactured by the German company Philos, which specializes mostly in wooden puzzles. If you're fluent in German you'll probably notice right away that there's something wrong with the name of the puzzle. It should read Berliner, not Bärliner, but actually, the name is a clever play on words with the design of the puzzle, featuring bear-shapes pieces (bär = bear). Comprised by 9 bears and a rectangular piece, the puzzle consists of two challenges, one easy and one hard. The first challenge requires you to place the 9 pieces flat in the frame; the second challenge is to add the extra piece, the rectangle to the already tight frame. Can you solve these two challenges? 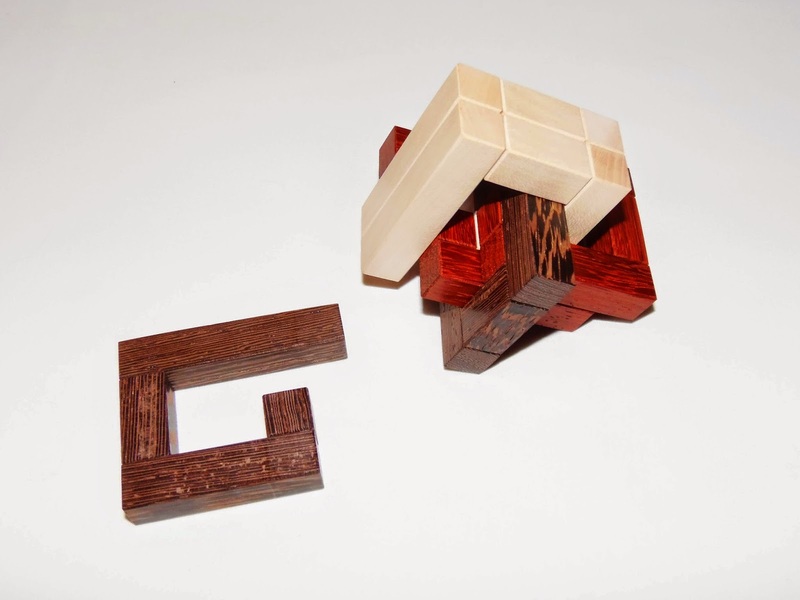 At first sight, the puzzle looks like it's made of plastic, but a close inspection reveals that it's in fact painted wood, both frame and pieces. In my opinion, it's not the best choices in terms of presentation, especially the chosen colors, which look a bit pale and washed out. Other than that, though, the puzzle is nicely built and the pieces are well cut, despite not being laser-cut. The oval frame measures about 14cm x 12.5cm (5.5" x 4.9"). The first challenge is quite easy to solve, with the pieces being placed a little haphazard inside the frame. I believe there's multiple solutions for this one, since there's more space for the pieces to move around. The second challenge requires a little more finesse playing with the pieces in order to find the extra space to pack the rectangle. 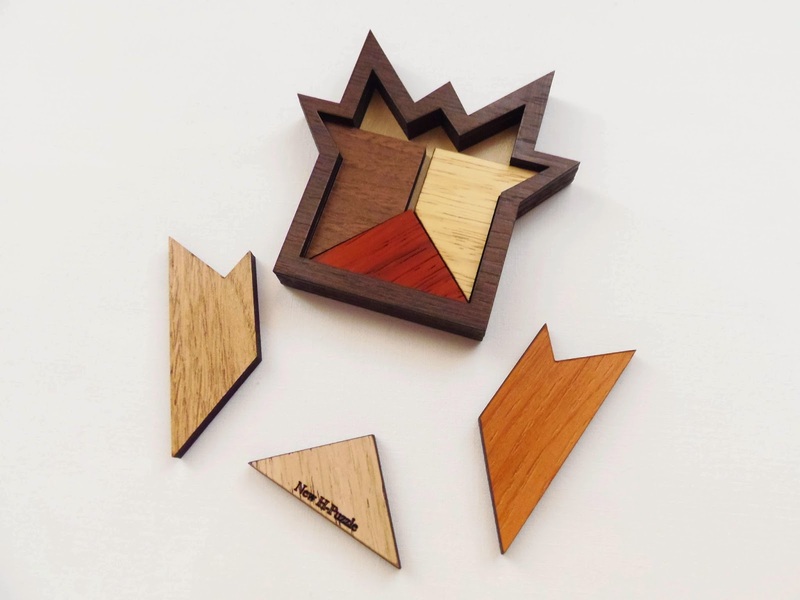 If you've played other Picture Frame Puzzles before, you'll certainly love this one. The solution to the second challenge may be unique, excluding rotations or flipped pieces, and it's somewhat symmetrical, more elegant. The puzzle is rated by the manufacturer as a difficulty level 3/4, but considering how the pieces should be packed in challenge 2, I reckon it's a little harder than that, maybe a 3.5/4. 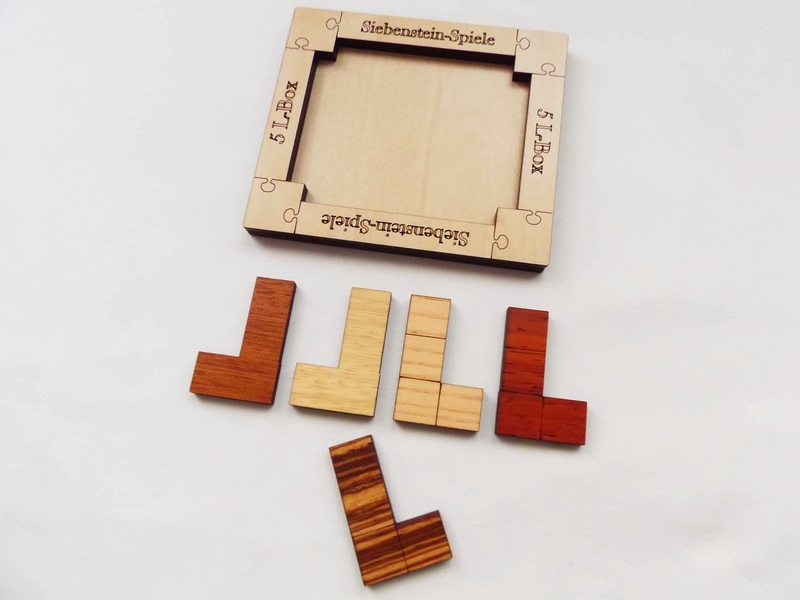 Ich Bin Ein Bärliner is a great packing puzzle and a welcome addition to my Picture Frame Puzzle family. The presentation could've been better with natural and contrasting wood colors, but it's still a worthy purchase. Availability: Ich Bin Ein Bärliner is available at PuzzleMaster for just $13 CAD. You can also find other puzzles from Philos. Back 2 Back is yet another fantastic game by Raf Peeters, who's the main designer at SmartGames and responsible for designing about 90% of their catalog. Even after having reviewed about a dozen of his games, I'm still amazed by the quality and originality brought to us by game after game. This logic game is a bit different from the usual ones where you lay the game board flat on the table. 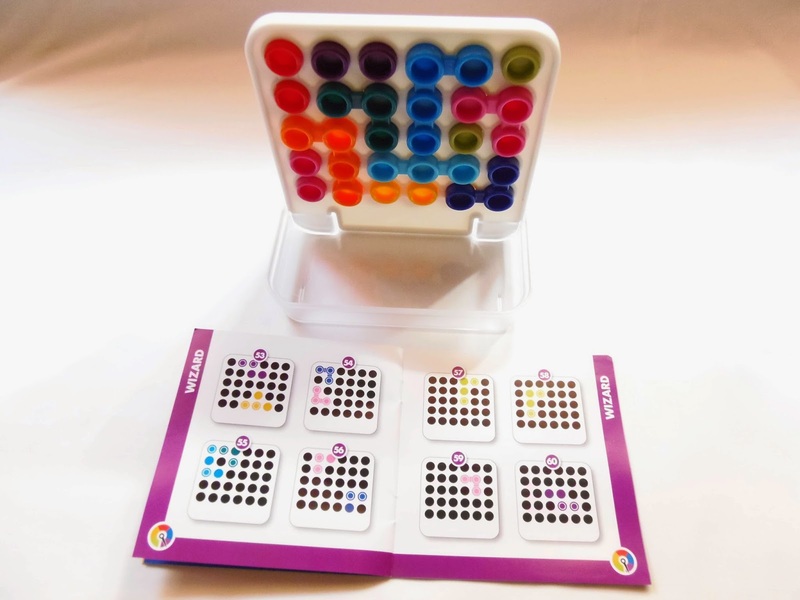 The presentation is similar to Connect 4 (or Four in a Line), where the game board is vertical and there's two sides to the game, both used in the same way - It's like looking at the other side of a mirror - There are 11 pieces, all distinct and with different colors, except for two, which are identical. 60 challenges are included with the game to keep you occupied for a while. The pieces of Back 2 Back are quite interesting. They consist of a mixture of two types of polyominos, trominos and tetrominos. Each piece looks rather normal on its main side, which only presents open circles. 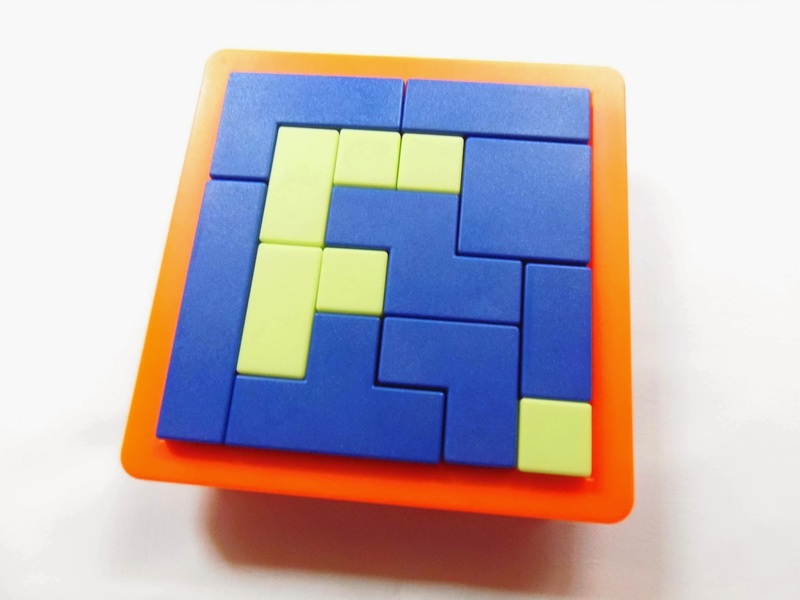 However, on its flip side a piece presents two protruding parts and one or two filled-up circles (depending on if it's a tromino or a tetromino). When placing a piece on the game board, the protruding parts can't be placed on top of another piece, only on empty spaces. Subsequently, another piece can't be placed on a space that has a protruding part. It's a confusing concept to grasp at first, but by the time you finish the starter challenges you'll get the hang of it. A challenge is only completed when all 30 holes in the grid are filled with the 11 pieces. 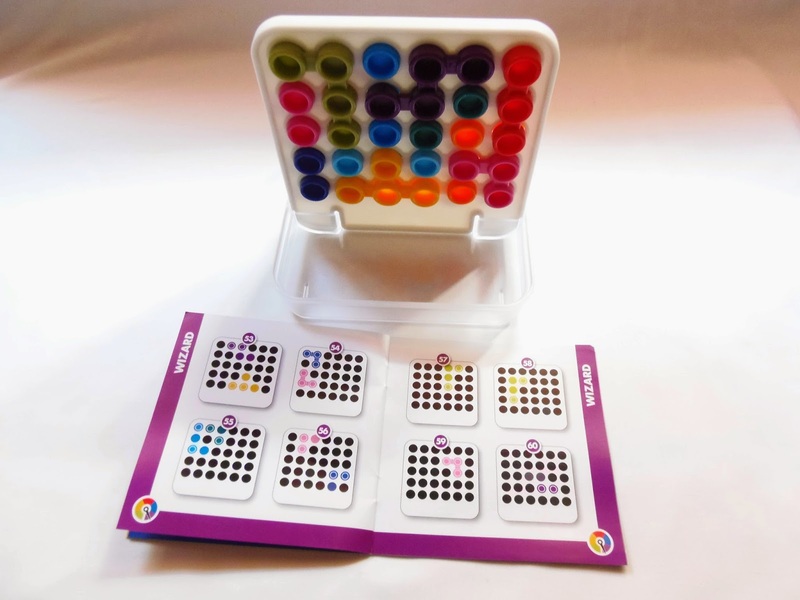 Starting from the first challenges, most of the pieces will already be placed on the board when you start to solve them. Harder challenges mean less pieces to start with and more guessing and trial and error, but it will also improve your strategic planning skills. This is essentially a packing puzzle, but presented vertically with two sides. I didn't find the Back 2 Back neither harder nor easier than other games by Raf. Just a tad more fun, because of the idea of thinking about two puzzles at once. Back 2 Back has been a very enjoyable experience. It's nothing like other games I've played, which is always a welcome thing, and brings new ways of thinking on how to tackle different problems. Whether you're 7 or 99 years old, the level of fun will be the same, and the five different difficulties will ensure there's something for everybody to enjoy. 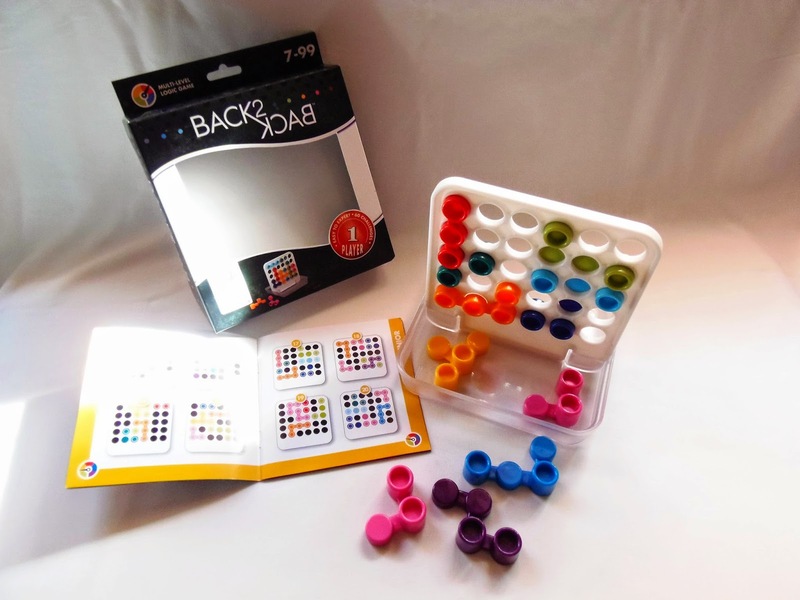 Availability: You can find the Back 2 Back game at PuzzlesdeIngenio.com, and many other games from SmartGames. If you've been puzzling for a few years, like I've been, you've probably seen at least on one occasion a packing puzzle featuring L-shaped pieces. There are quite a few of these puzzles out there, and of all the possible tetrominos (polyomino of order 4) you can do (I J L O T S Z), the L (or J) seems to be the most chosen shape to design puzzles. The reason could be just because it's easier to visualize possible arrangements or even because it's a more elegant piece to work with. Whatever the reason used by puzzle designers, I'm fine with their choice. 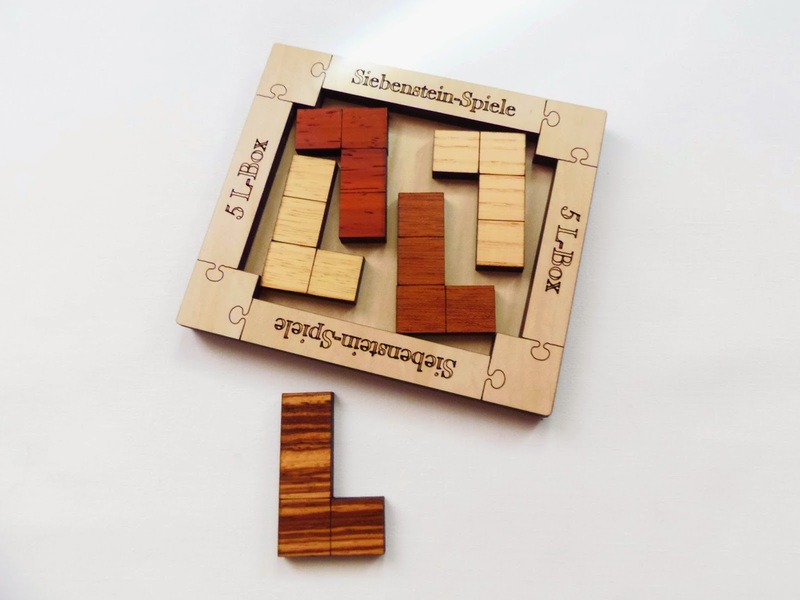 My latest L puzzle is called the 5 L-Box, designed by Jürgen Reiche from Siebenstein-Spiele, and it may be the hardest of the L puzzles I've tried so far. As the name suggests, you're presented with 5 identical L-shaped pieces inside an irregular frame. The fifth piece, however, is not flat on the frame, so you have to find the correct arrangement for the five pieces. Knowing Siebenstein-Spiele's work pretty well, I honestly expected a better work on the frame. It looks too bland, especially the wood color chosen for it. It lacks the usual stylish and elegant designs that this company has accustomed us in the past. The five pieces, though, are very well done, each in a different tone and showing the marks of individual units on the top side. Measuring 11.2cm x 9.8cm (4.4" x 3.9"), the puzzle is not very big, but it's acceptable considering it's a packing puzzle. Rated as a level 6/7 by the manufacturer or 9/10 by PuzzleMaster, the classification is spot on. This is, in fact, a very challenging puzzle, because the solution is very deceptive. You're led to believe the pieces should be used in a certain way, but in this case you have to think outside the box. The frame, for example, is irregular for a reason. If you take the piece's units as a measurement device you can find that the dimensions of the frame are about 4.9 units x 5.9 units. That means you can't place pieces side by side that occupy an area of neither 6 nor 5 units in length. It also means the solution must show the pieces in a tilted angle rather than parallel to the sides of the frame. The 5 L-Box is far from being one of the best-looking puzzles from Siebenstein-Spiele, but...it's definitely one of the best, concept-wise. It's a very challenging puzzle that plays with your preconceived notions of what's allowed and what's not allowed in your packing puzzle solving process. Availability: As of writing this review, the 5 L-Box is out of stock at PuzzleMaster. You can check back at a later time or you can browse other designs by Siebenstein-Spiele. 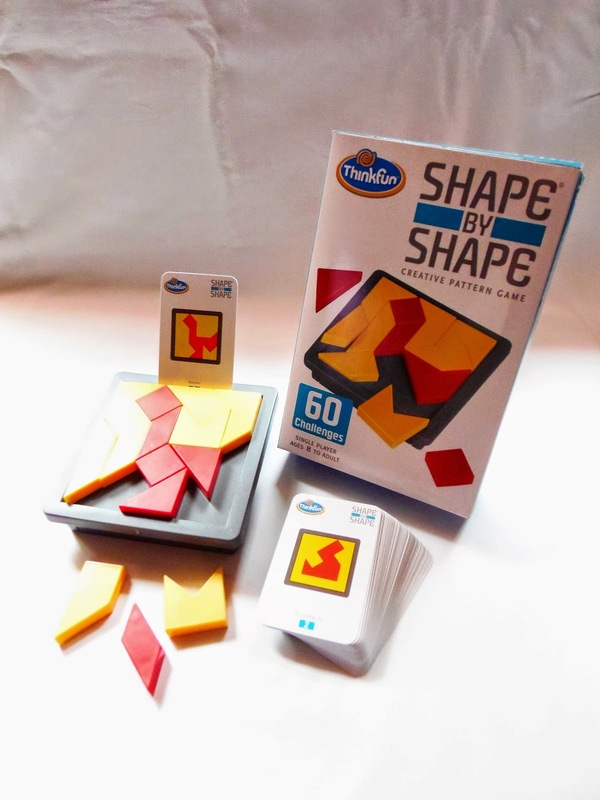 Recently, I reviewed the Shape by Shape game from ThinkFun, one of their four "By" series, and I was quite impressed with the versatility of the game, which allows you to create all kinds of interesting shapes and patterns. Now, I've spent some time with another one of these fascinating games, the Square by Square, and I'm equally excited by its capability of pattern-making. 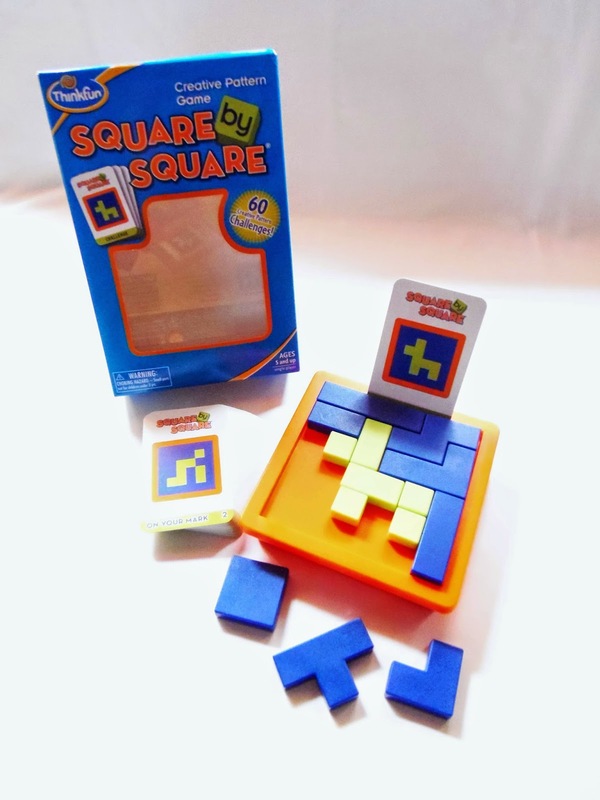 This time, instead of focusing on a Tangram-like concept, the makers of this game, Yoshikatsu Hara and Yoshio Kimura, were inspired by the nature of polyominoes (pieces made by joining square units into different shapes). In the game you can see a mixture of monominoes, dominoes, trominoes and tetrominoes. 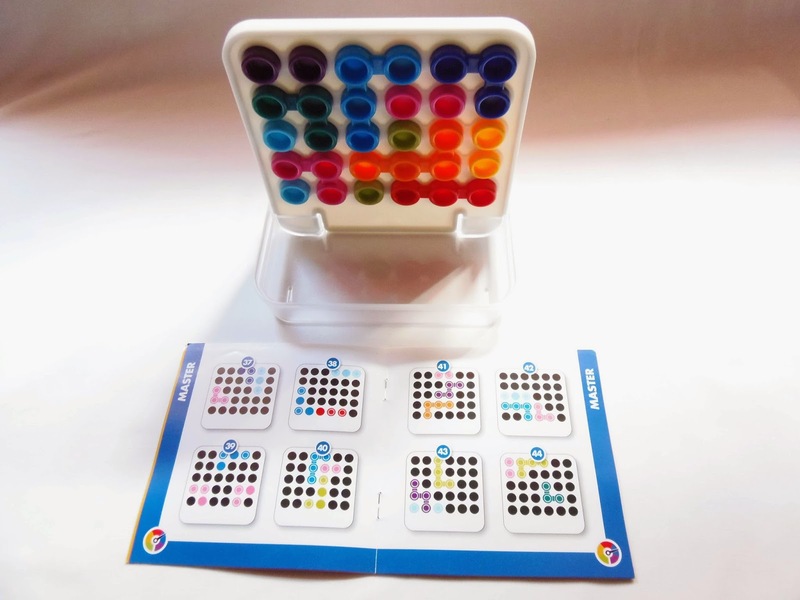 There are a total of 14 pieces, eight blue and six green, and with them you can create numerous patterns and shapes. 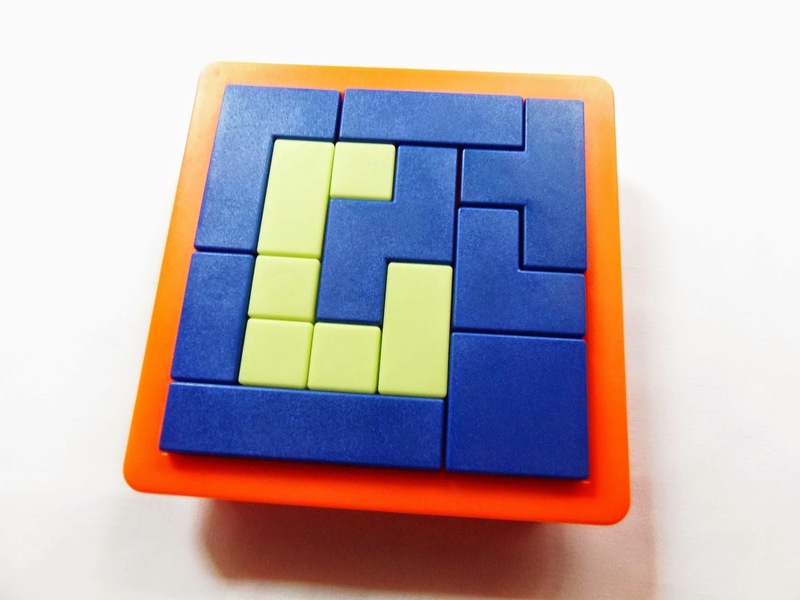 The game already includes 60 challenge cards with figures for you to solve, but when you finish these you can resort to your imagination and creative skills to create your own patterns (see the example below, with my initials). From what I was able to experience so far, the Square by Square is the easiest game of the four, because the monominoes and dominoes ensure you have lots of possibilities to place them on the board. However, that doesn't mean it's not fun to play with it. In fact, it means it's easier to create your own patterns as well. Another perk of this game being easier is that each challenge has multiple solutions, many ways to reach the same goal. 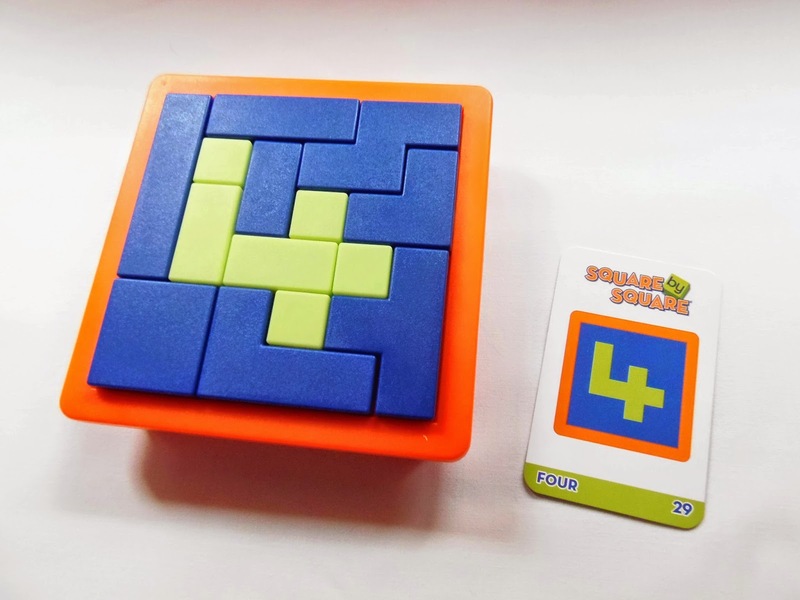 The Square by Square is the perfect puzzle to get started on packing puzzles, because you'll learn more clearly the relationships between the different types of polyominoes and how they interact with each other. It will give you the confidence to try more demanding puzzles and, ultimately, enjoy them best. 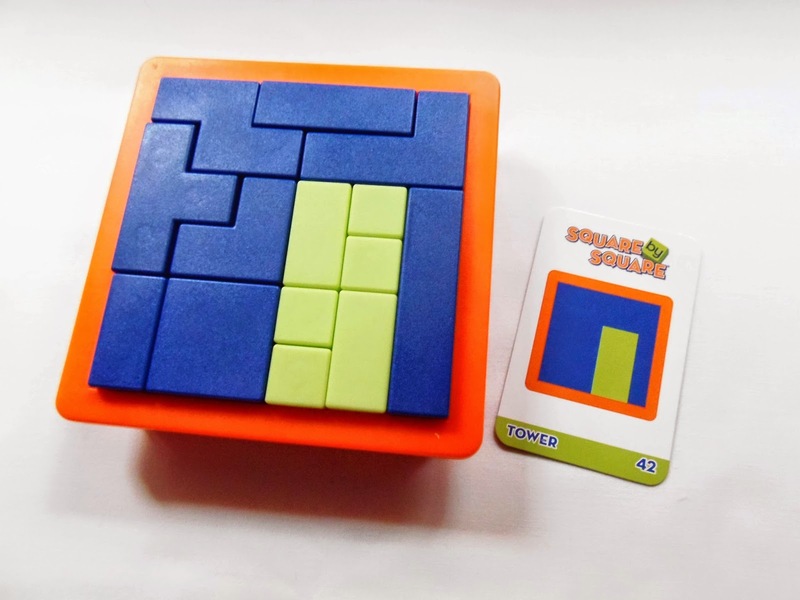 Availability: I got the Square by Square at PuzzlesdeIngenio.com. You can also find there many other games from ThinkFun. Disentanglement puzzles have become quite popular these days, mostly due to Hanayama and their Cast Series. There are many types of disentanglement puzzles: some of the hardest ones have a mixture of metal and rope, but I prefer the metal-only ones, for obvious reasons. 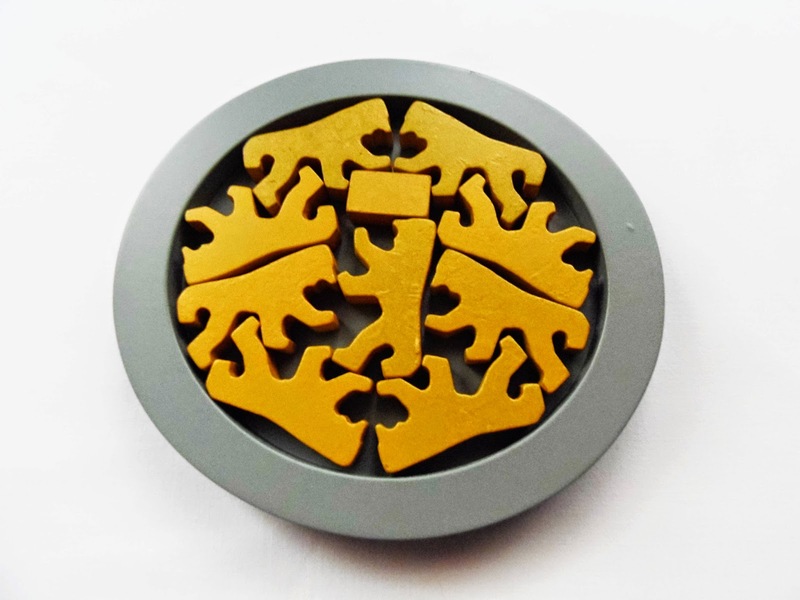 Even though Cast Puzzles are more popular and usually of better quality, it doesn't mean that other metal puzzles out there are rubbish. A good example of this is The Captive Ring (a.k.a Magic Loops), which was first introduced in Europe and America in the 19th century. If I didn't know all Cast Puzzles pretty well, I'd say this puzzle could belong to the beloved Hanayama brand. It's very well built with a thick and strong wire (6mm in diameter - 0.2") and has a length of 11cm (4.3"). It's also coated with a shiny and smooth surface, which is better for handling it. The puzzle is comprised by two loops and two rings. One of the rings connects the two loops and can't be removed from the frame. The other ring, however, is free to travel across the length of the loops, but not entirely free, since the middle ring is blocking its path. Your task is to find a way to free the ring and then return it to its original position. Although this looks like a very difficult puzzle, it's actually moderately challenging. On the Hanayama scale of 1-6, a fair rating would be a 3/6. The Captive Ring was a very pleasant surprise for me. 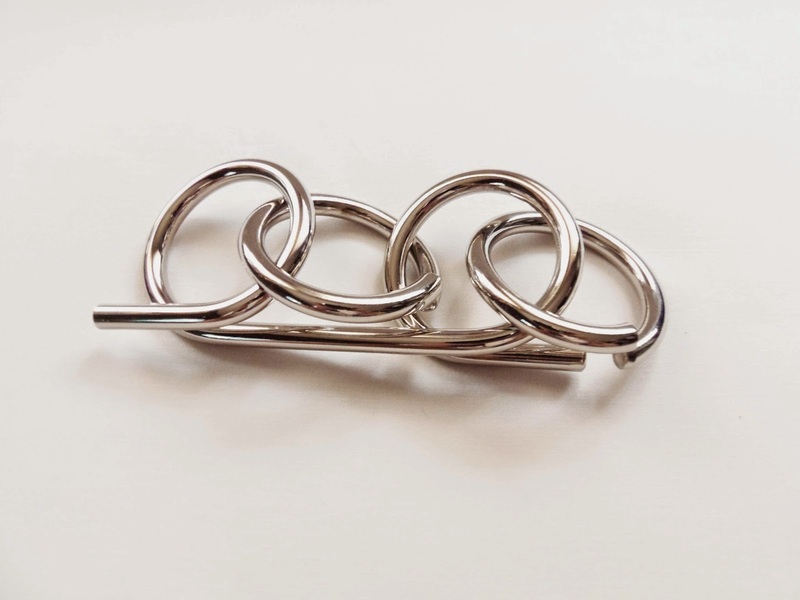 With a simple topology, an elegant design, and a challenging, but not frustrating solution, it's a great one to get you started on disentanglement puzzles. Availability: You can get find The Captive Ring at PuzzlesdeIngenio.com for just €1.50. They say "If it ain't broke, don't fix it". While this statement may be true in most situations, when it comes to puzzles it's sometimes the other way around, especially if you're talking about Jürgen Reiche, who designs most puzzles for Siebenstein-Spiele. 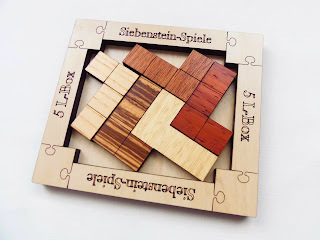 This German-based company not only creates their own puzzles, but also improves on other known designs, resulting always in a better and more interesting puzzle overall. One of such examples is the New H-Puzzle, a variation of the classic H-Puzzle that has been around for over a century now. 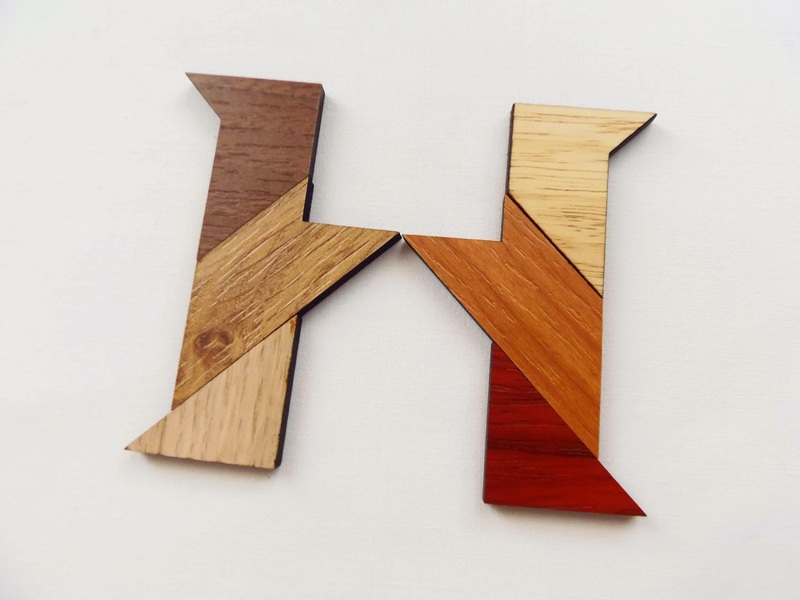 As a matter of fact, the H-Puzzle is itself a variation of the T-Puzzle, which was invented as a way to promote the tea that came from Ceylon (now known as Sri Lanka). 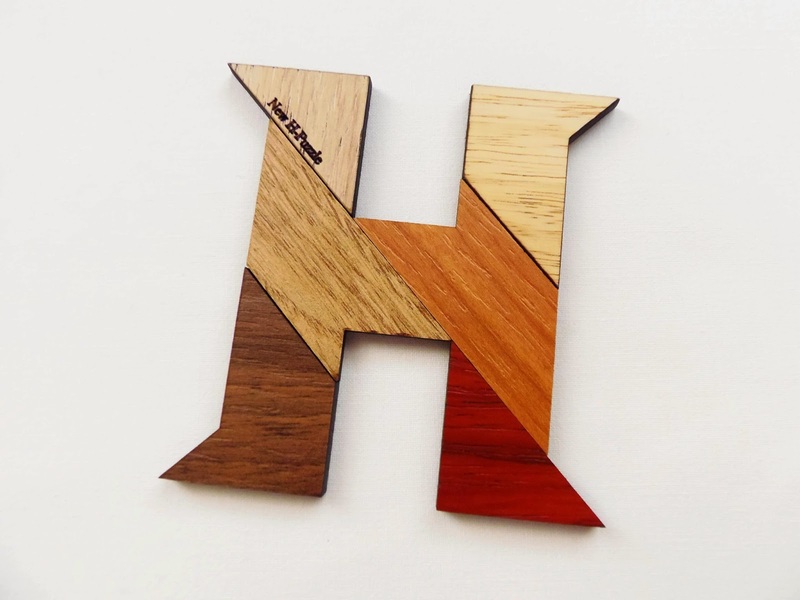 Much like the T-Puzzle, the H-Puzzle was also invented as a promotional item, except they weren't looking to sell tea but Hathaway's Bread instead. Since then, other letter puzzles were also created, like the F or the K...but for now, let's just focus on the New H.
If you already know the classic H-Puzzle, then the differences between the old and new versions of the puzzle are easily spotted: the H in the old version is made in a sans-serif font and the new is made with serifs. The result is much more elegant, but those are not all the improvements Siebenstein-Spiele made. One improvement that stands out right away is how the puzzle is presented, which comes in a stylish dark wooden frame. 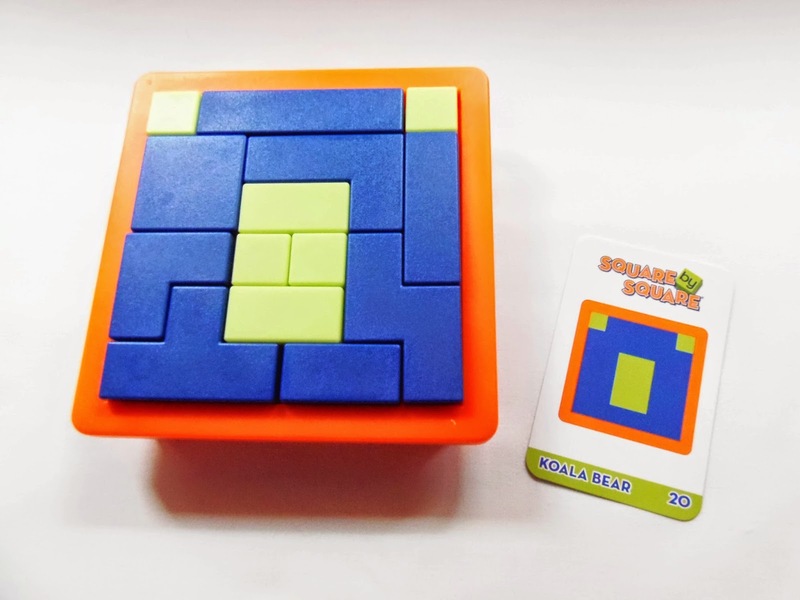 The puzzle is actually very small, measuring only 8.5cm x 8.3cm (3.4" x 3.3"), which fits perfectly on the palm of your hand, due to the fact that the pieces are packed in two layers of three pieces each. Also, each of the six pieces is made in a different wood color, as different types of wood were used. The goal is simple, but deceptively hard, since making the letter H from those six pieces is not very intuitive. The six pieces are actually three pairs of identical pieces, and the solution has a nice symmetry. I already knew the H-Puzzle before, but I couldn't remember its solution, so it was still a bit challenging figuring out how to solve it. The puzzle is rated as a level 9/10, but from my experience I don't believe it's that hard. Before finding to the real solution, I stumbled upon a couple of failed attempts at making the H. An example of this can be seen below...Could still be seen as an H, no? A few minutes later, I was finally able to build a perfect letter H. What complicates the task of discovering the solution are those two longer pieces with the right angle cuts. Combining them in the right way is a real exercise of spatial and visualization skills, but once you do the other pieces will fall in place almost immediately. The key to solve the puzzle lies in those two special pieces. 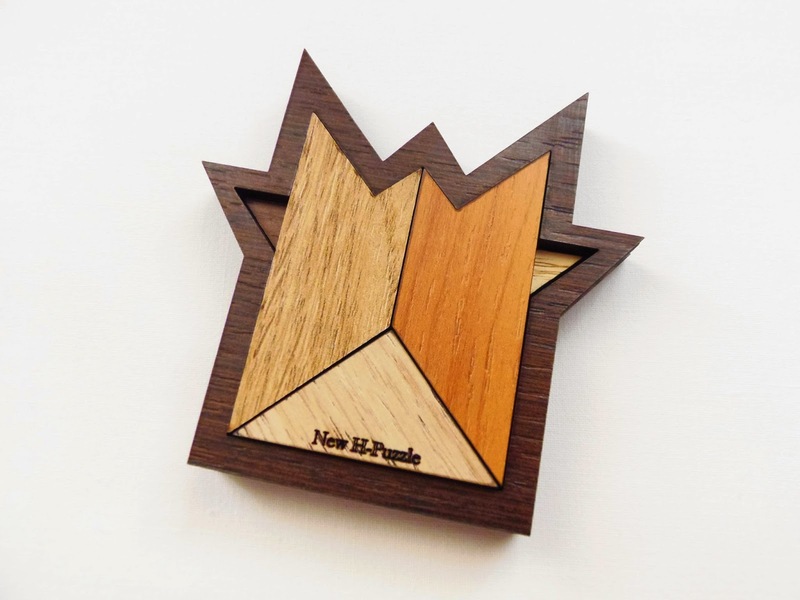 Availability: The New H-Puzzle can be purchased at PuzzleMaster for just $14.99 CAD. 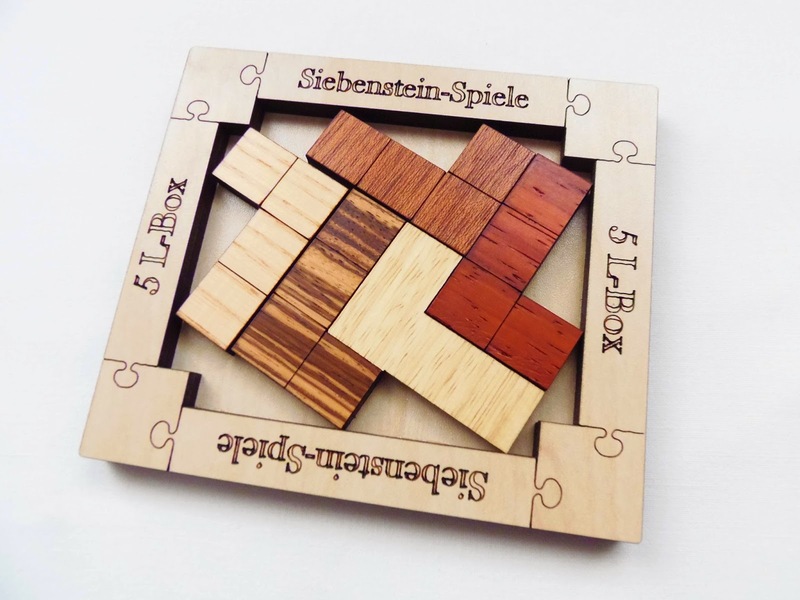 You can also get other interesting puzzles by Siebenstein-Spiele. 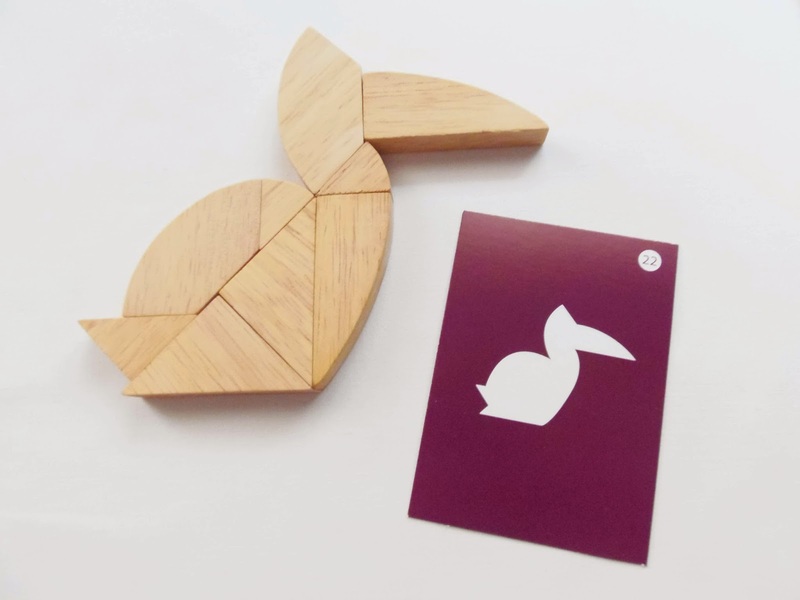 Tangram-like puzzles have come a long way since the original was brought to the west in 1815. The concept is so simple and yet it has been captivating the imagination of so many people for centuries. To me, there's nothing like the classic Tangram, but some variations still deserve our attention, if not for their originality. That's exactly what I feel about the Logic Egg (a.k.a Magic Egg or Columbus Egg), with the first versions introduced by the Richter Company in the 1890's. The Logic Egg is made out of 9 pieces: four of them have an identical counterpart and only one piece is unique. When put together, the pieces form a flat egg-like shape. The version I got is very well built with natural wood and is presented in a nice box with a closing lid. 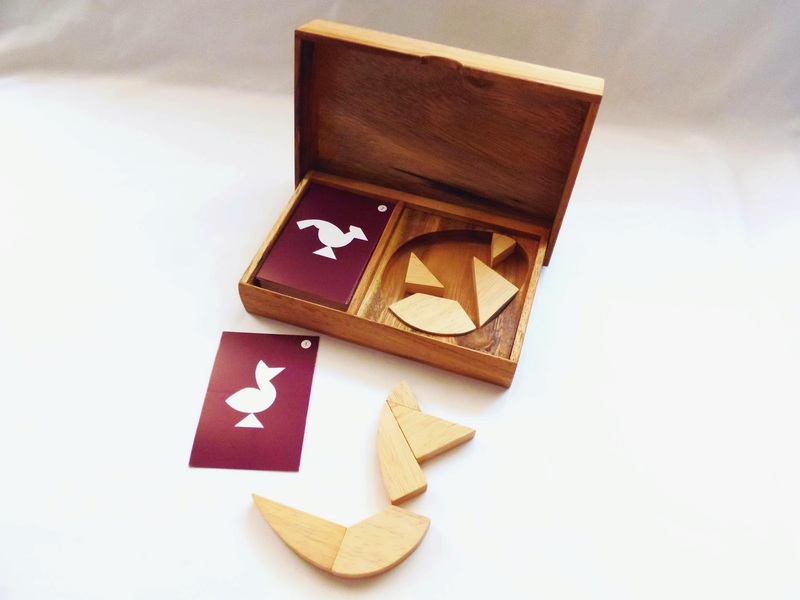 Inside, you can see the pieces neatly packed into the egg shape and a slot with 54 cards with bird shapes. The theme of the puzzle is very original, showing you first the egg shape - where all birds come from - and from there all 54 shapes can be built with the nine pieces - you must use all the pieces in every challenge. 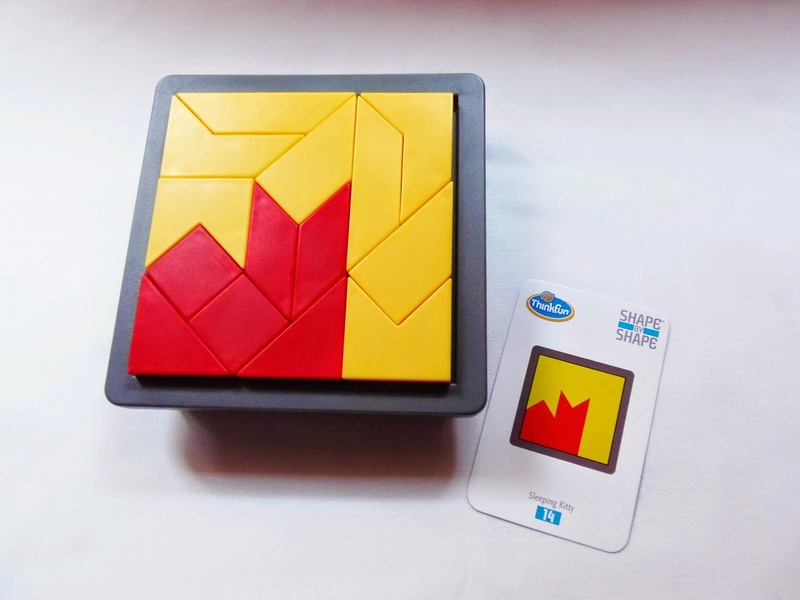 At first, I was having trouble solving the challenges, because the pieces have a very unique and peculiar shape that usually are not used in other puzzles: only three pieces have a regular shape, a triangle (two large ones and a smaller one). Also, the cards are not divided in difficulty levels, so you can't start with the easier ones - they're all challenging. As I went on, though, I started to recognize patterns within the shapes that could only be accomplished with certain pieces, and the puzzles were slowly becoming easier to solve (emphasis on "easier", since these puzzles are not easy to solve). I believe the puzzles on the Logic Egg get easier as you progress through all the cards, and this is where I reckon it lies the big difference between the original Tangram and other variations. 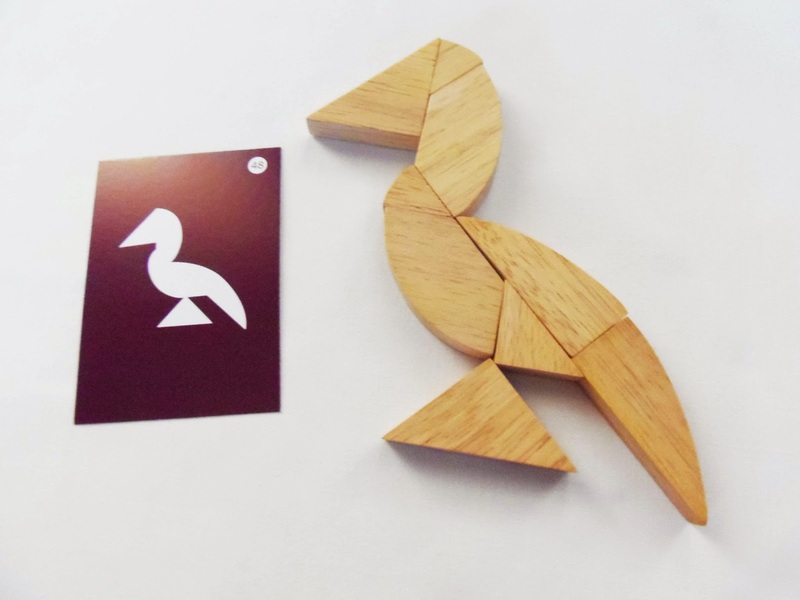 Some Tangram shapes are still very difficult to solve, no matter how many you've managed to solved. It seems there's a special harmony between all seven pieces of the Tangram, a mathematical beauty, like no other puzzle has ever been able to achieve. Packing puzzles and the likes are among my favorite puzzles. I love the idea of picking up a few pieces and turn them into something else, a recognizable shape, a symmetrical image, or simply anything your imagination commands you to. For this, I can easily recommend the Logic Egg to any puzzle fan out there. Availability: The Logic Egg is available from Brilliant Puzzles, in the US, for $27.95. If you like egg-shaped puzzles, check out their other offers. ThinkFun has a very interesting selection when it comes to logic games, which caters to all skill levels and personal tastes. 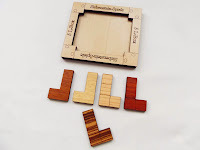 One particular type of game that I find really interesting is their collection of four pattern games that I like to call the "By" series: Shape by Shape; Square by Square; Brick by Brick and Block by Block. These games have the ability of creating all kinds of 2D and 3D images, recognizable objects or shapes, using only a few pieces. 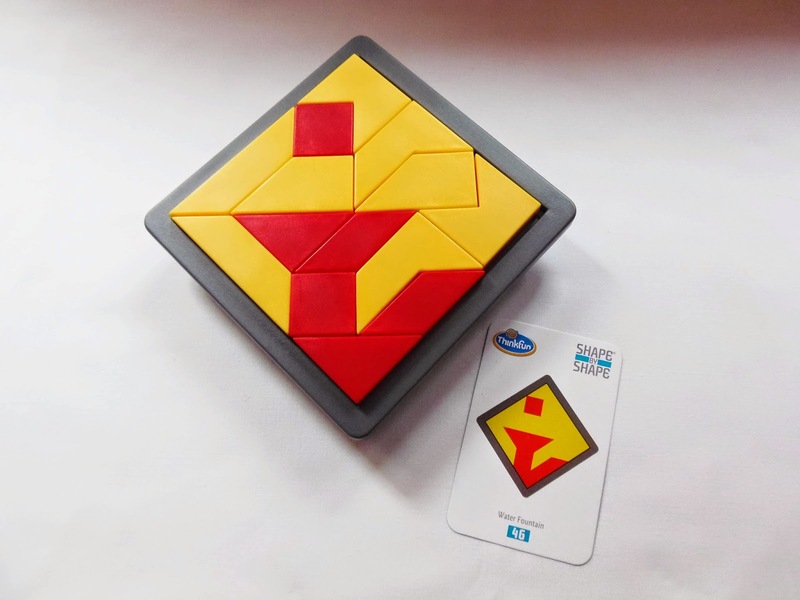 The game featured in this review is the Shape by Shape, invented by Nobuyuki Yoshigahara, and is reminiscent of a well known classic puzzle, the Tangram. The game actually reminds me of another great game (presentation-wise), the Lokulus, which is based on Archimedes' Stomachion puzzle. 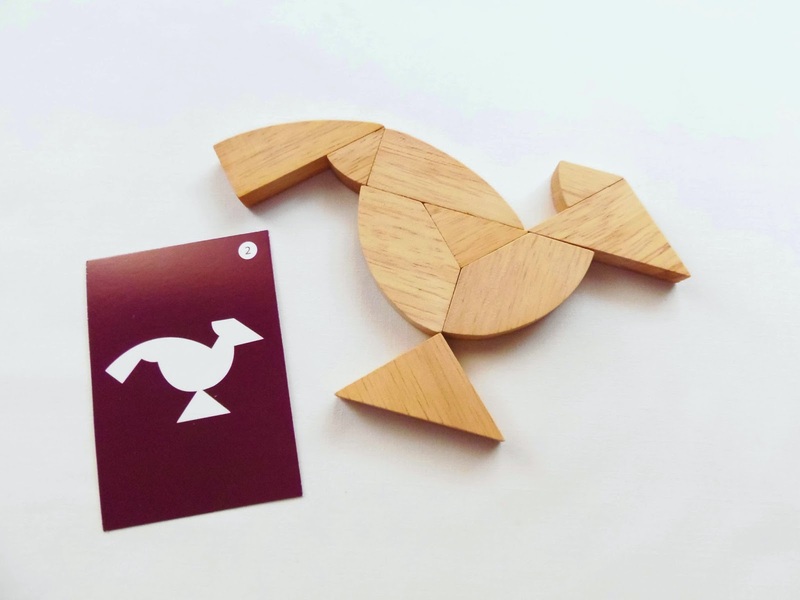 If you know or have played the Tangram puzzle before, then you'll feel right at home with Shape by Shape. The idea and principle behind the puzzle is basically the same: build recognizable shapes with the puzzle's pieces. 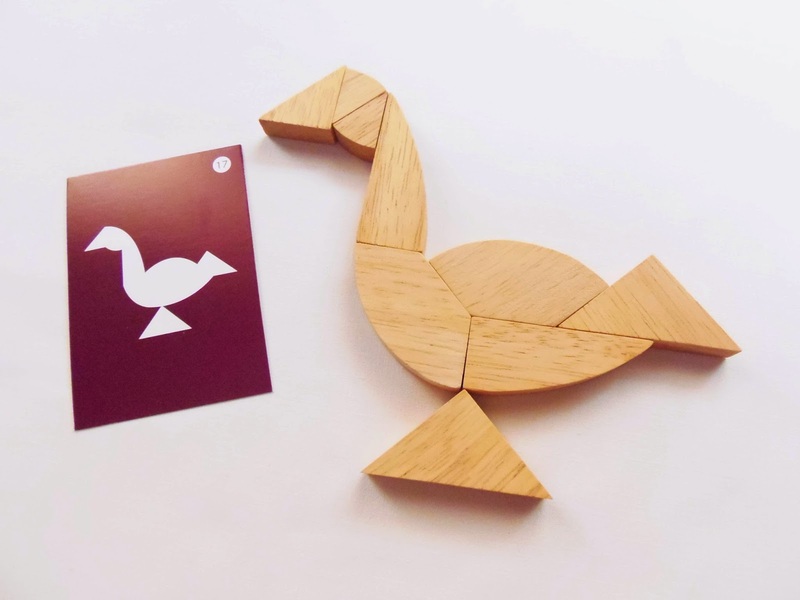 The challenge here, however, seems a little more complex than the Tangram, mainly because instead of seven pieces there's a total of 14 pieces you need to assemble into any given shape. The game consists of six red and eight yellow pieces. The high contrast between the two colors will ensure that any shape you build is clearly visible in the tray. 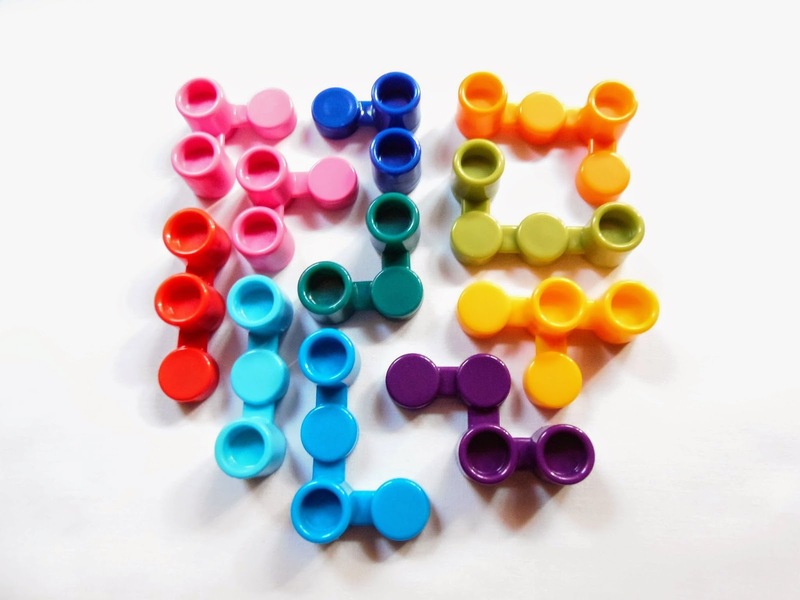 Made with strong and durable plastic, the pieces are thick and very easy to handle. You can turn and flip any piece the way you want, as long as it lies flat on the game tray. To solve any shape, all the pieces must be used and the resulting image has to be a perfect match of its counterpart in the challenge card. With 60 different shapes to try and solve, there's a lot of building to do before you get tired of the game. Unlike other logic games, the cards are not separated by levels of difficulty. Without a clear indication of difficulty, any challenge can be considered easier or harder than the previous one. 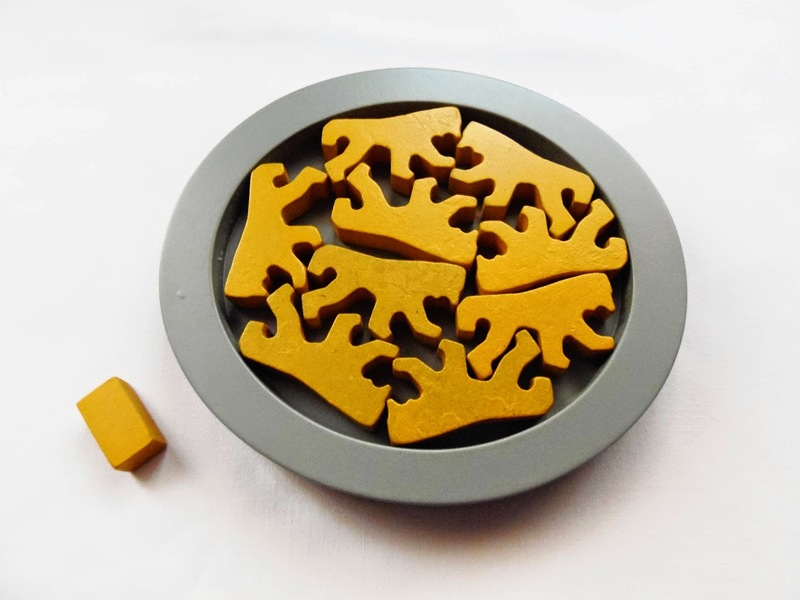 The challenge of the game lies in combining the two groups of pieces, yellow and red, in the tray. 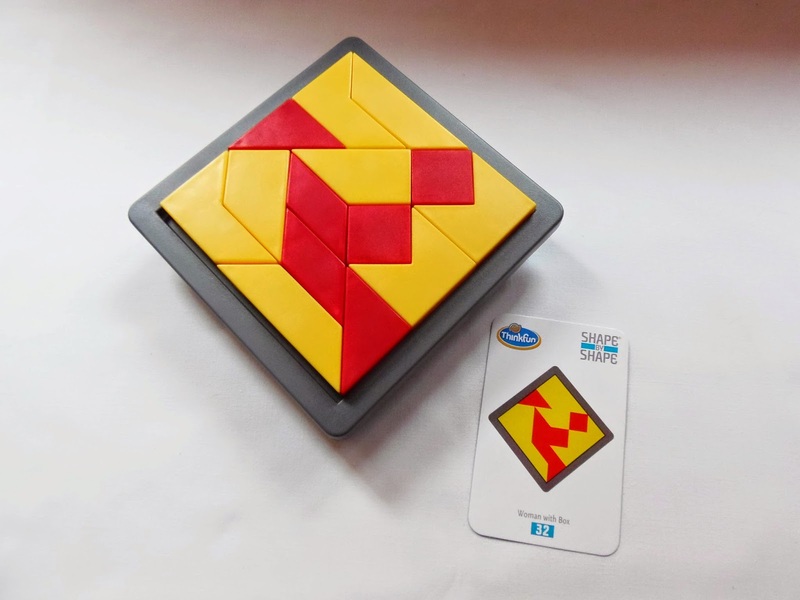 It's essentially a 2-in-1 game, because you have to build the shape with the red pieces, and then the yellow ones have to be placed as well to complete the picture. 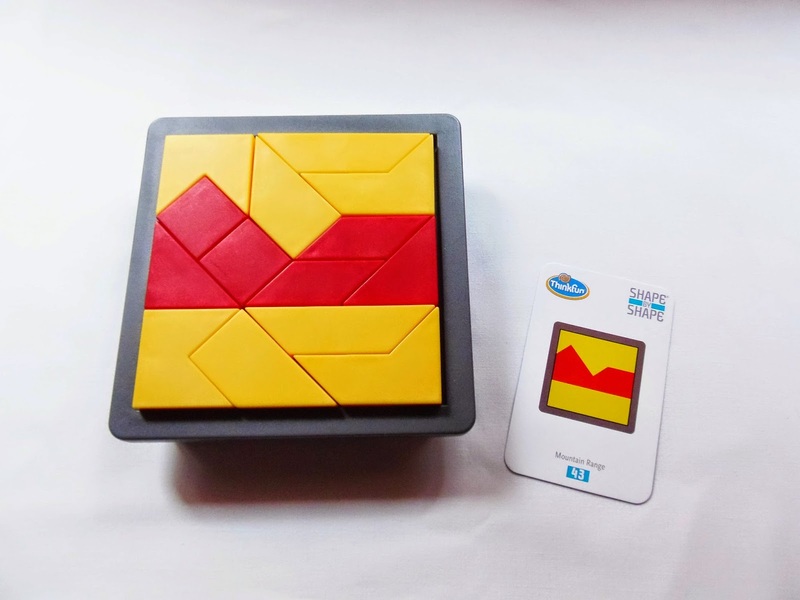 You can build the shape first and work around it by placing the remaining yellow pieces, or you can do a mixture of both, placing red and yellow pieces alternately. I found it easier to just build the shape first, like a Tangram puzzle. Each challenge has more than one solution, so you can always try to find alternative arrangements for the pieces. 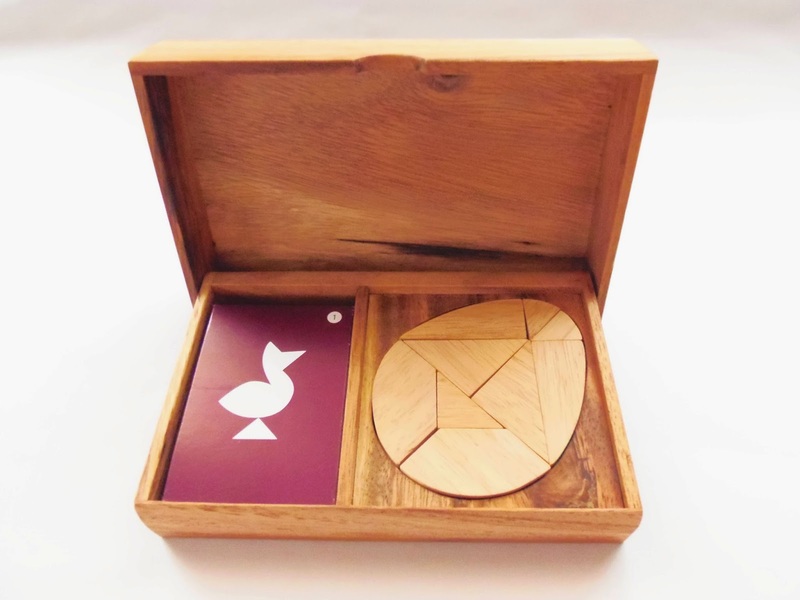 Shape by Shape is a great puzzle for any Tangram aficionado. Like its older cousin, the possibilities are virtually endless, so you can also try to build your own shapes. I still prefer the Lokulus game, but this one comes very close. 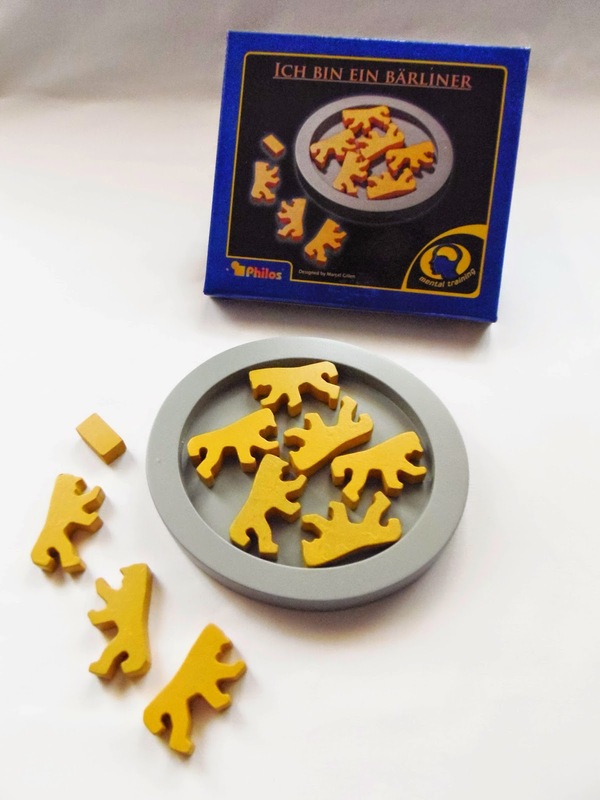 Availability: You can get the Shape by Shape game at PuzzlesdeIngenio.com for €16.95. You can also find there other games by ThinkFun.